Kissed by a cool breeze..
Two of our guests experience the magic of Tivoli Bays on Sunday. 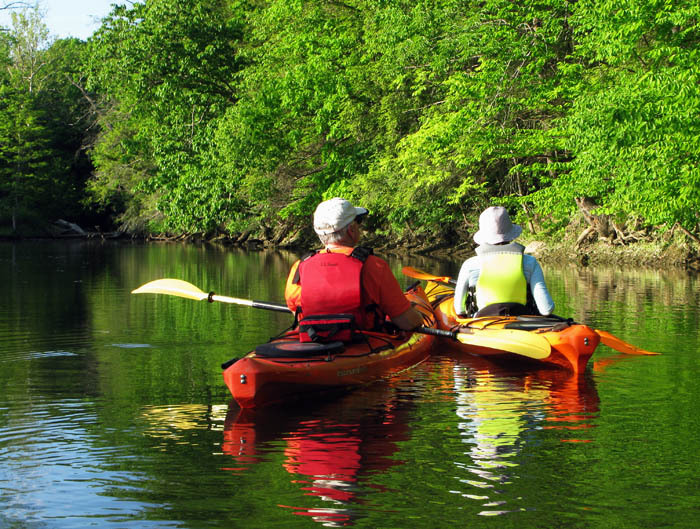 There is so much beauty to see when you paddle Tivoli Bays, which is made up of two large coves surrounded by wooded bluffs. It is one of our favorite places to introduce people to the water. From the tidal marsh you get an amazing view of the Catskill Mountains when looking off to the west. Right now all but the highest peaks are covered in spring green. 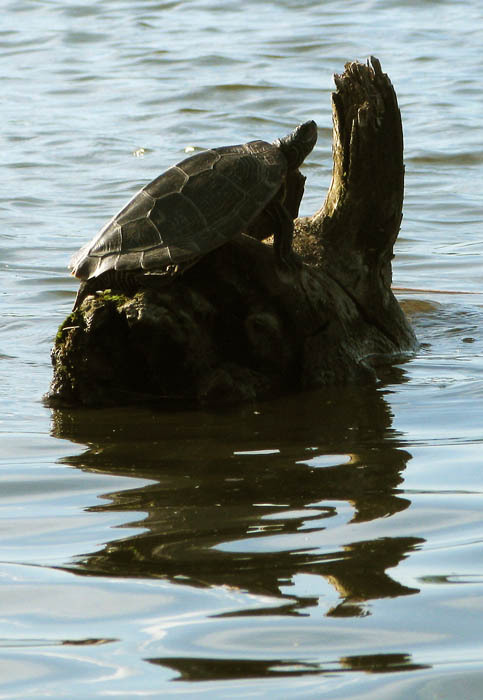 A turtle rests on a stump in the sun in Tivoli Bays. As we navigated through the bays we saw narrowleaf cattail (Typha angustifolia), spatterdock (Nuphar advena) and wild rice (Zizania aquatica) interspersed with purple loosestrife (Lythrum salicaria) and common reed (Phragmites australis). We also notice larges patches of yellow iris in bloom. During the tours we spotted great blue herons, a pair of bald eagles, and a green heron. It is very important to keep the tides in mind when exploring the bays. There is about a four hour window of time around high tide which allows access to the many wonderful inlets. As we wound up the tour we drifted up to the north end where the Stony Creek empties into the bay. As we approached the gurgling fresh water, we were greeted by the cool breath of air spilling over the sun-warmed water of the bay. One can only comprehend this magical kiss from the fresh water by experiencing it. We have a tour leaving Tivoli Bays at 2pm on Sunday and have two more spots open. It’s going to be a B-A-U-tiful day!!! Oh, did I mention the wild yellow Iris are in bloom? The water temperature at Rhinecliff is 62.2 degrees. No excuses. The leaves are turning green and the water is warming up. The weather has taken that turn, you know, when there are more sunny days than gray rainy ones. It is once again time to get back out on the water. We are gearing up for another wonderful season with our friends who share our love for the water. We also look forward to introducing the water-soothing experience with many new people in the upcoming season. If you are looking for a fun, safe experience, drop us a line. We can get you there. The sun sets over the Hudson River in Rhinecliff on Monday evening. We have had a wonderful season of paddling. It has been our pleasure to take so many clients out on the Hudson and Tivoli Bays over the past several months. With autumn upon us, our season winds down. We will be taking out just a few fall folliage tours before the water temps dip too low. It is my hope to paddle up to the first snowfall again this year. Equipped with the right outerwear to stay dry, warm and safe. Please continue to check the blog. We will continue to post photographs and thoughts on the river and beyond. A pair of bald eagles and a juvenile bird was sighted near Rhinecliff during Monday's sunset tour. We spend a lot of time on the Hudson River and get a chance to see amazing wildlife out on the water. Throughout the season our guests have gotten to see many eagles during our tours, but during last night’s sunset tour we came across this pair of eagles with two young birds in one of the back bays along the river. We sat and watched the birds for quite some time. They were curious and allowed us to view them from our kayaks. After sitting a while we paddled off in peace, leaving the birds to there roosting, heading back t0 Rhinecliff in the light of the setting sun. What a beautiful evening. Join us, we will share the wonders of the Hudson River with you. A couple enjoys a recent tour on the Hudson River. We have been busy taking out tours and enjoying the summer weather. The water is warm and there is usually a great breeze on the river, making morning and evening paddles extremely popular. If you see your summer slipping by and have not got a chance to enjoy the water, now is the time. Not to scare you, but Labor Day weekend will be here before you know it. 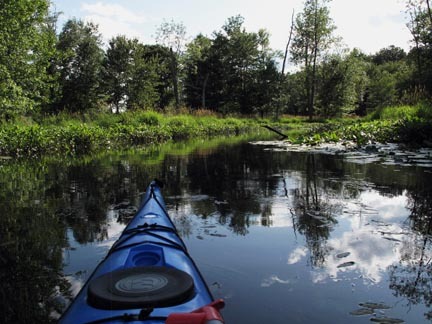 Paddling along in Tivoli Bay, under the watchful eye of a heron. We would love to take you out on a two or four hour tours, and spend some time sharing the wonderful Hudson River with you.